Treasurer Mike Nahan, City of Melville chief executive Shayne Silcox and Bateman MLA Matt Taylor. Bateman MLA Matt Taylor writes about sleeping rough for a good cause. The annual event hosted by the St Vincent De Paul Society raises awareness and crucial funds in support of Vinnies ‘important homeless services. Over 100,000 Australians experience homelessness every night of the year, with almost half being women and around 25 per cent being children under 18. This year was the sixth year the event has run in Perth, and my third successive year sleeping out. Each year demonstrates the event’s uniqueness as we hear about raw experiences from people who have been or still are homeless. This is often confronting but one of the most valuable aspects of the event for me personally. This year we heard from a young lady named Jess. Jess left home at 11 to try to find her homeless father. Jess said the streets were a better place for her than the home she left at such a young age. I struggle to comprehend how that must have felt for her as her experience is so foreign to my own. There were many other situations she courageously shared with Sleepout participants that were deeply moving. The Vinnies offer services and support to assist people experiencing homelessness and transition them from hopeless situations into a safe and dignified living environment. I was glad to hear that Jess eventually found her father and that the Vinnies are currently working hard to secure them some accommodation of their own so they can live together independently. A highlight was a long conversation past midnight where Treasurer Mike Nahan, Melville chief executive Shayne Silcox and myself spoke with Director General Department of Child Protection and Family Support Emma White. This year’s event raised more than $800,000 for Vinnies homeless services in WA, an impressive figure considering tight economic circumstances facing many West Aussies. 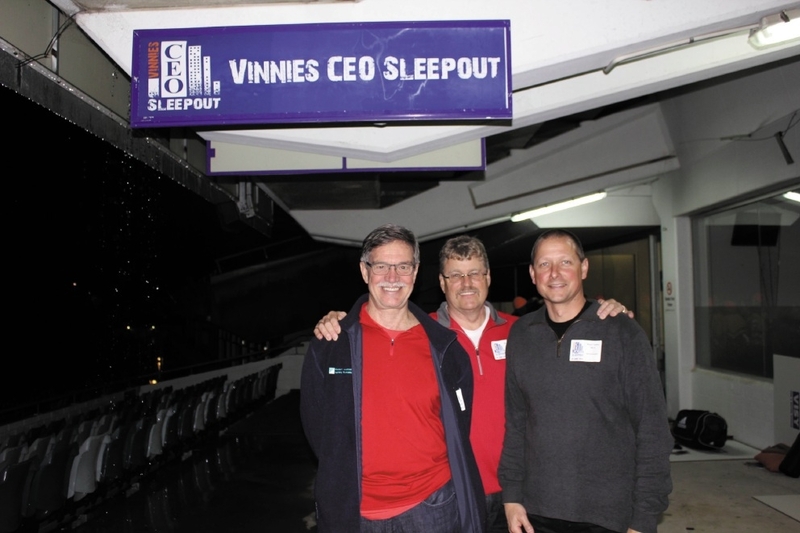 As for the sleeping conditions, trading the comfort of my home for a sleeping bag and piece of cardboard is a small price to pay to highlight the fantastic work that the Vinnies do with some of society’s most vulnerable and disadvantaged people.